At some point, for the first time, Jessica Warboys submerged a coloured canvas in the sea. After the waves, wind and salt had contorted the pigments, she pulled it onto shore. That initial inspiration triggered the series of large and unframed 'sea paintings' that Warboys has become known for. One of these paintings and a film are currently on show at the Laing Art Gallery in Newcastle upon Tyne as part of AV Festival 14: Extraction. As I walked into Warboys' exhibition space at the Laing, I saw that the entire left wall was dominated by Sea Painting, Dunwich 2014. All of her sea paintings are titled simply where and when. Standing in front of it, my entire field of vision was filled. The surface of the mostly primary coloured canvas resembled a loosely cinched tie-die, or the blotted face of a polished stone. Directly in front of the painting, in the middle of the room, there is a large shoulder-high rectangular box. On one side of that box, the 2013 short film by Warboys, Ab Ovo, plays in a back-projected loop. 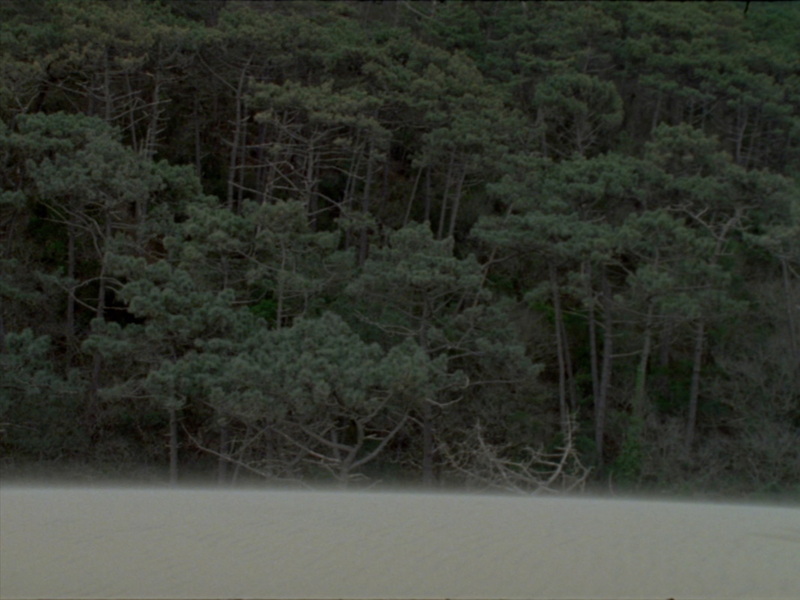 The film is set in the Dune of Pilat in France; the tallest in Europe. The east side of the Dune skirts a forest. The border is constantly shifting as one environment dominates the other. Warboys has chosen this movement as a main subject. The atmospheric soundtrack adds texture and interest to the narrative. Through the course of the film we are shown the sand, the forest, the forest and the sand, and curiously an ostrich egg. The egg is referenced in the title of the film, Ab Ovo, which translates literally to, “from the egg” in Latin. Besides the intentional placement of the egg, the film, as with the painting, has used the process of nature to build its aesthetic. There is more than a hint of the early 20th century Dada artworks by Jean Arp in Warboys' work. Arp famously created "chance" collages by dropping torn paper and pasting them however they happened to fall. In a similar fashion, Warboys has given up her composition to the chaos of physics. Arp challenged our very understanding of art as an intentional act, and Warboys is doing the same. The paintings are interesting and provocative as concepts, but they're in danger of slipping into blandness at the aesthetic level. If I had walked into the exhibition without any prior knowledge or written prompts about her work, would I have been reminded of the sea? Would I have thought about the movement of water and wind? The answer is probably not. To focus blindly on a visual experience in Warboys' work would almost be missing the point, but to ignore the role aesthetics can play in triggering and enhancing a works meaning would also be missing the point. If Warboys can find a way to intensify the paintings without compromising the concept of chance, they will move from interesting to profound. Jessica Warboys’ solo exhibition at the Laing Art Gallery is open until the 6th of April, 2014. For more information on the 2014 AV Festival visit http://www.avfestival.co.uk/.